TSR's wish is my command. Well apparently the Royal family didn't like Harry's last girlfriend because she was African, even if she was white-African. I hope Harry breaks the ridiculously bigoted expectations of his family and marries someone from another race! How can we call Britain an open-minded, multi-cultural nation if our Royal family is still inbreeding to keep itself 'pure'. Yeah, because clearly if Harry decides to marry someone from a race that makes up only 92% of the population of the UK he's clearly inbreeding to keep his family 'pure'. You trollin' again i see. I can actually imagine someone naming their child 'Barackisha' or 'Obamaniqua'. Maybe I've just watched too many american comedies. ...or Asian, for that matter, would she have been allowed to marry William? Part of me thinks somehow the Royal Family would have ensured that he stopped seeing her. 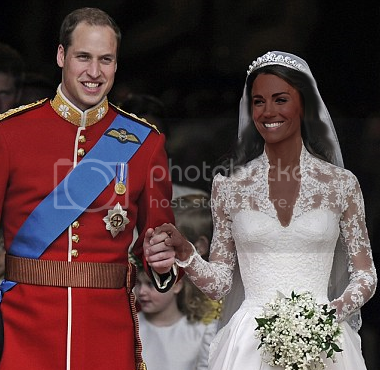 If Kate Middleton were black, we wouldn't even know she existed. I doubt William would ever have gone out with her: not because he's necessarily racist but because he has to produce an heir. Unfortunately, the country is still too traditional to mix different races into the royal bloodstream. Kate Middleton will also have been checked for any diseases, history of infertility etc that may be continued in the royal bloodstream in order to preserve the royal bloodline. I was actually thinking this earlier. Im really not too sure at all. Hahaha.. you must be kidding right? It would be like Othello. and i could have used today as revision for my A2's. The more obvious problem would have been if she was Catholic. This is not an issue if the girl was willing to convert. But no way would the queen allow a prince to marry a black/asian girl. She would only let harry marry a common girl if she was beautiful and well kept. Get some better slang tbh, that actually makes sense. ahahhahah, why thanks i must admit i can sometimes hear house prices dropping when i walk past houses. You mean in Toxteth? Their not that bad.. at least not anymore from what I hear. As for house prices/social conditions, have they not improved significantly over the last few years. I also love Irish people thats an added bonus about the city. Trust me they would. Although the Princess (and future Queen?) of Liechtenstein black and there doesn't seem to be much of an issue there, and that's Liechtenstein ffs. Then again the British Royal Family is more important than all others combined. haha i don't live in Toxteth but it had calmed down in recent years. and the houses there are really tiny , luckily for me i live in the outskirts of Liverpool so it's pretty calm here. Kate Middleton's hair colour. What is it? Do Norway girls all look like this? Guys - thoughts on hoop earrings?